It’s another day to make fun of CNN, so that makes it another very special day. And yes, Jim Acosta is involved. The Montana rally President Trump held last night is already triggering members of the elite news media because he made a joke about Rep. Greg Gianforte bodyslamming The Guardian’s Ben Jacobs. Yes, there are a great many media writers who think we’re being targeted, and that our jobs are similar to that of first responders and members of the military. We’re not. Keep your head on straight, people. Direct messages can only be seen by the sender and receiver, but Justin Caporale, a former aide to first lady Melania Trump, made Acosta's message public by tweeting it to his own followers. F**k you,” Acosta wrote to Caporale, using Twitter's private direct message option. 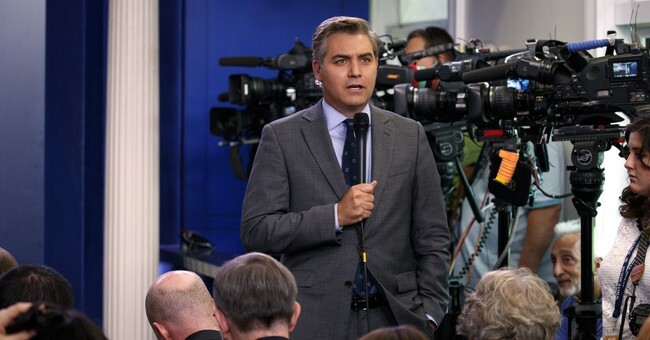 The Federalist’s Mollie Hemingway noted that it also seems that the “dear diary” swipes at Acosta on Twitter seem to get under his skin, so keep ‘em coming folks. The best thing about @acosta cussing out the former Melania Trump staffer who did the "Dear Diary" thing with him is learning how enraged the "Dear Diary" thing makes him.